Turning Point : Fall Of Liberty is a new Xbox / PS3 game by Codemasters and it has been promoted with some innovative online work. Winston Churchill was run over by a New York taxi in 1931. He survived this, however the game works from the premise that he didn't. As a result New York is invaded and the game play focuses around the efforts of a New York resistance movement. But the interesting marketing advertising is based around a blog and Facebook. Codemasters launched a search (through a blog at http://codemastersquest.wordpress.com) to find Mario Contasino, the driver of the 1931 taxi that ran over Churchill. This has been linked to by a range of websites and has received significant press coverage. 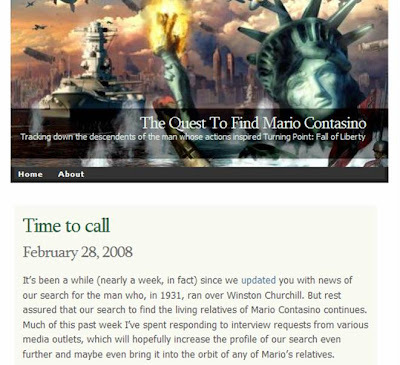 The quest was also spotted by The Genealogue (http://www.genealogue.com/2008/02/bonkers-for-yonkers.html) and they helped trace not just Mario Contasino but his relatives too! At the outset of the campaign typing 'Mario Contasino' into Google returned only four results and the query 'Contasino' returned ten. Typing 'Mario Contasino' into Google now produces 2,620 results and 'Contasino' returns 3,910. So on Google indexing alone this looks like a successful campaign. There is also activity on Facebook. A profile has been set up for Mario Contasino and anyone befriending him (430 friends at the last count) is entered into a prize draw to win a PS3 and a copy of the game. Whilst there has been standard display activity, the blog quest and the Facebook work raise this advertising above the bulk of other video game promotion!